Scapula is a thin, flat triangular-shaped bone placed on the postero-lateral aspect of thoracic cage . It has 2 surfaces, 3 borders, 3 angles and 3 processes. The prominent spine of scapula divides the surface into a smaller supraspinatous fossa and a larger infraspinatous fossa. The depth of the supraspinatous fossa is filled by the supraspinatus muscle. It is thin and shorter. 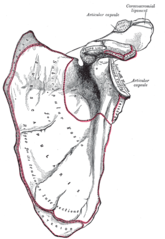 It presents the suprascapular notch near the root of the coracoid process. The superior border extends from the superior angle laterally towards coracoid process. This is thick and presents infraglenoid tubercle at the upper end. The lateral or axillary border runs from the inferior angle to the lateral angle of the scapula. This is thin and extends from superior to inferior angle. With the arm resting by the side, the medial or vertebral border runs almost parallel to the spinal column. 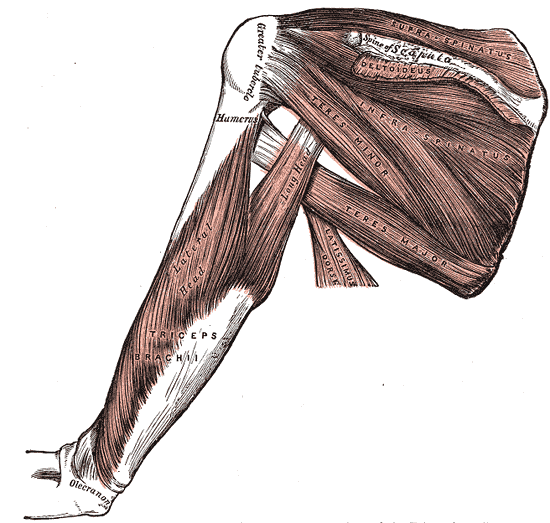 Inferior Angle is covered by the latissimus dorsi. It moves forwards round the chest, when the arm is abducted. Palpation of the inferior angle provides a convenient method for following the movement of the scapula during arm motion. Lateral or Glenoid Angle is broad and bears the glenoid cavity or fossa, which is directed forward, laterally and slightly upwards. Spine or Spinuous Process is a triangular plate of bone with 3 borders and 2 surfaces. It divides the dorsal surface of the scapula into supraspinous and infraspinous fossae. The posterior border is called the crest of the spine which has upper and lower lips. The Acromion Process has 2 borders, medial and lateral; 2 surfaces and a facet for clavicle. Subscapularis arises from the medial 2/3rds of the subscapular fossa. Infraspinatus arises from medial 2/3rds of infraspinous fossa, including lower surface of spine. Deltoid arises from lower border of the crest of spine and from lateral border acromion. Trapezius is inserted into upper border of crest of spine and into medial border of acromion. 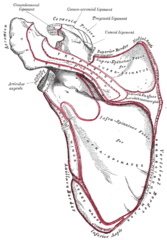 Serratus anterior is inserted along the medial border of costal surface; 1 digitation from the superior angle to the root of spine, 2 digitations to the medial border, 5 digitations to the inferior angle. Long head of biceps brachii arises from supraglenoid tubercle; and the short head from lateral part of tip of coracoids process. Pectoralis minor is inserted into the medial borderand superior surface of coracoids process. Teres minor arises from upper 2/3rds of rough strip on the dorsal surface along the lateral border. Inferior belly of omohyoid arises from upper border near suprascapular notch. The coracohumeral ligament is attached to the root of the coracoids process. The coracoclavicular ligament is attached to the coracoid process; the trapezoid part on the superior aspect, and the conoid part near the root. The coracoclavicular ligament is made up of 2 bands: the conoid and the trapezoid, both of which provide vertical stability. The coracoacromial ligament connects the coracoid process to the acromion. The suprascapular ligament bridges across the suprascapular notch and converts it into a foramen which transmits the suprascapular nerve. The suprascapular ligament lie above the ligament. The spinoglenoid ligayment bridges the spinoglenoid notch. The suprascapular vessels and nerve pass to it. Subscapularis Bursa, between the subscapularis and the serratus. ↑ 1.0 1.1 1.2 1.3 Williams GR, Shakil M, Klimkiewicz J. Anatomy of the Scapulothoracic Articulation. Clin Orthop Relat Res. Feb 1999;237-46. [Medline]. ↑ 2.0 2.1 Culham E, Peat M. Functional Anatomy of the Shoulder Complex. J Orthop Sports Phys Ther. Jul 1993;18(1):342-50. [Medline].